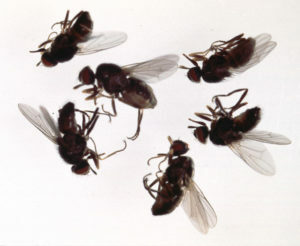 Cluster flies can be annoying, and can quickly take over your home. Andy’s Pest Control uses a proactive approach to dealing with these seasonal invaders. During late summer/early fall these seasonal invaders are emerging from the soil and looking for a warm place to live during the winter months. When doing a cluster fly treatment we use a combination of a residual spray on the exterior of your home to ensure they stay out of your home. We also treat inside window and door frames as well as your attic to ensure any cluster flies that have already entered before our visit will be dealt with. Getting a treatment done in the late summer or fall will greatly reduce the amount you will see in the spring. 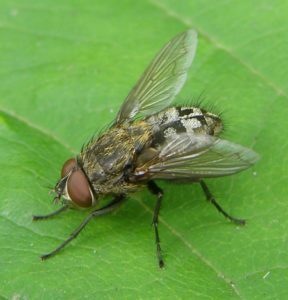 Cluster flies come out of dormancy in the spring and look for good, rich soil to lay their eggs. The eggs will attach and parasite off earthworms until they reach maturity in the late summer. They will then emerge from the soil in search for a warm place to go dormant over the winter. Then the cycle will continue. Are some homes more prone to getting Cluster Flies? As we all know, farmers have some of the best soil surrounding their homes. This soil is perfect for the success of cluster fly life cycle. The rich soil produces perfect habitat for earth worms and as we know, cluster fly larvae will parasite off earthworms. Farm houses are prone to higher infestations due to being the only nearby structure offering warmth throughout the winter. Home that have light coloured siding are also more prone. As the sun shines on a white sided home it appears as a giant light source for cluster flies and provides warmth. Think of it as “flies to light” – your home being that light source. Andy’s Pest Control services all of Peterborough, Lindsay, Kawartha Lakes as well as Bancroft!